That said, Little Pea loves grilled cheese sandwiches, so when I make them at home, I add the veggies the restaurant version lacks. The key is to chop the added veggies into a manageable size for tiny toddler teeth. In this Pesto Zucchini Grilled Cheese recipe, julienned zucchini and sun-dried tomatoes are paired with pesto and Italian cheeses to make a grilled cheese that kids and adults will love. A note about the bread: sourdough is my favorite bread for making grilled cheese, but the crust can be a little tough for younger toddlers. I often cut off the crust, but when Little Pea is teething, I leave it on so she can gnaw on it and ease some of that discomfort. Crusty bread is one of our favorite teethers. Feel free to substitute another bread in this recipe if you like. 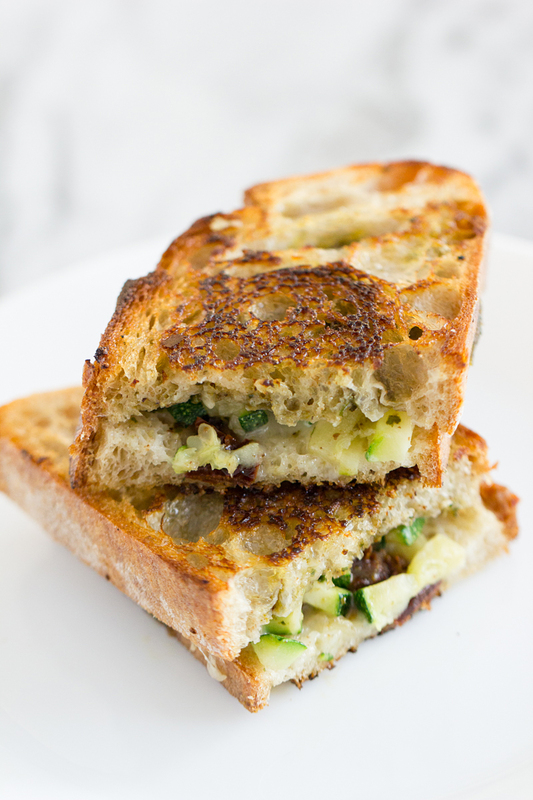 Garlicky zucchini, sun-dried tomatoes and pesto add flavor and nutrition to this grilled cheese sandwich. Heat the oil in a large skillet over medium-high heat. Add the garlic to the skillet and cook until it's fragrant, about 20 seconds. 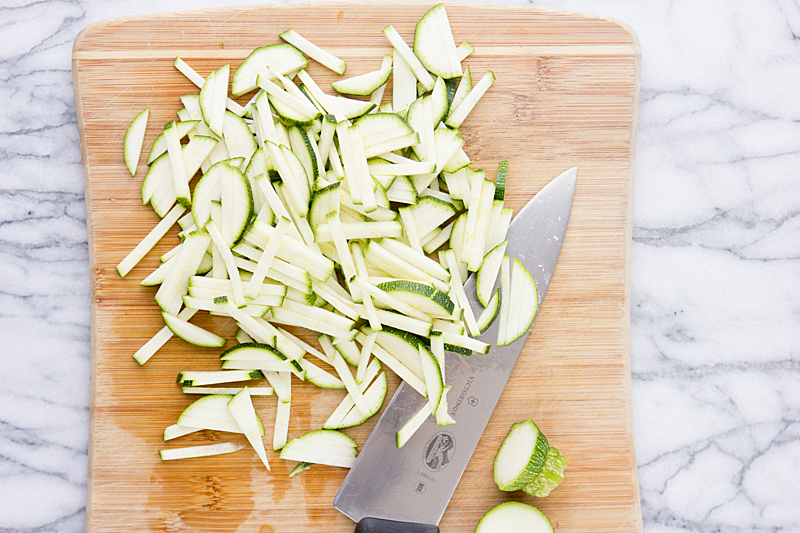 Stir in the zucchini and cook for about 2 minutes, stirring often, until the zucchini is softened slightly, but not limp. Remove from heat and add salt to taste (if using). Place 4 slices of bread on a work surface and spread each with 1 tablespoon of pesto. Divide the zucchini and tomatoes onto the bread, then top with the cheese and the remaining bread. Butter the tops of the sandwiches with 1/2 tablespoon of butter. Wipe the skillet clean with a paper towel and return it to medium heat. Flip the sandwiches over and place the buttered side in the skillet. Once all the sandwiches are in the skillet, butter the tops with the remaining butter. Cook for about 5 minutes on each side, or until golden brown, watching closely to make sure the bread doesn't burn. When serving grilled cheese to my daughter, I like to cut it into strips to make it easier for her to hold; with this particular recipe, you can even put a little marinara in a cup on the side for dipping.